Preheat the oven to 200° and set a rack in a rimmed baking sheet. In a medium bowl, whisk the flour with the baking powder, baking soda, cinnamon and salt. In a large bowl, whisk the brown sugar with the sour cream, butter, egg and 1 teaspoon of the vanilla. Using a wooden spoon, stir in the dry ingredients, then stir in the carrots and walnuts. 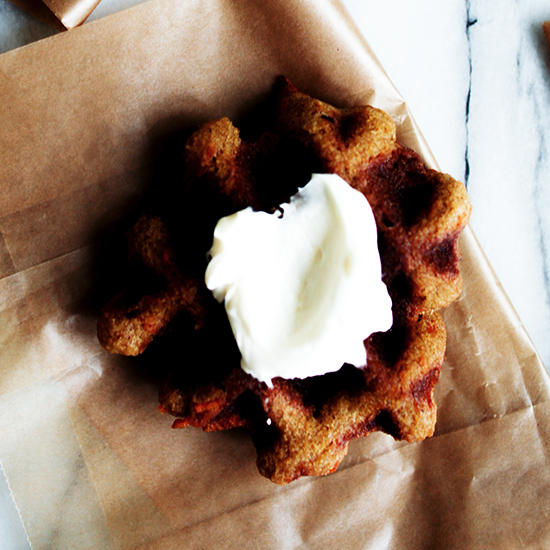 Preheat a waffle iron and brush with butter. Scoop 1/3 cup of the batter into the center of the iron, spreading the batter with the back of a spoon. Close the iron and cook until the waffle is deeply golden and crispy, about 5 minutes. Transfer the waffle to the rack in the oven. Repeat with the remaining batter. Meanwhile, in a medium bowl, using a handheld electric mixer, beat the heavy cream at medium speed until soft peaks form. Reduce the speed to low and beat in the confectioners’ sugar, cream cheese and remaining 1 teaspoon of vanilla until firm peaks form. Serve the waffles with the whipped cream and maple syrup. The waffles can be made earlier in the day and warmed in the oven.